Availability Please contact us for pricing and availability. Other Information Pricing is based on availability and is subject to change. Please contact us for pricing. Nestled inside the newest luxury resort in Las Vegas, Vdara catapults 57 stories above the CityCenter metropolis. This posh condo-hotel boasts 1,495 designer-furnished suites with world-class amenities including 24-hour in-suite service, concierge, a full-service spa and fitness center, pools with private cabanas and a comprehensive business center. The non-smoking, non-gaming tower provides an enclave of escape and tranquility to its guests with a 67-acre resort complex outside its doors offering fine dining, lavish boutiques, world-renown entertainment and a colossal casino. Vdara’s silhouette has become one of the most striking design statements in all of Las Vegas presenting guests some of the best views in the city. The tower’s commitment to green initiatives has awarded Vdara as one of the world’s largest environmentally sustainable urban communities. 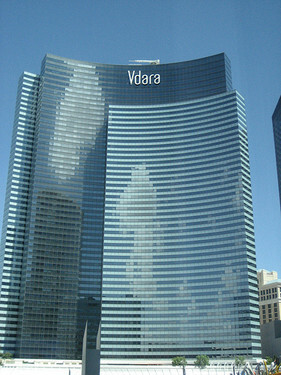 Escape to Vdara and indulge in luxury with the excitement of the Las Vegas Strip just steps away from your front door.